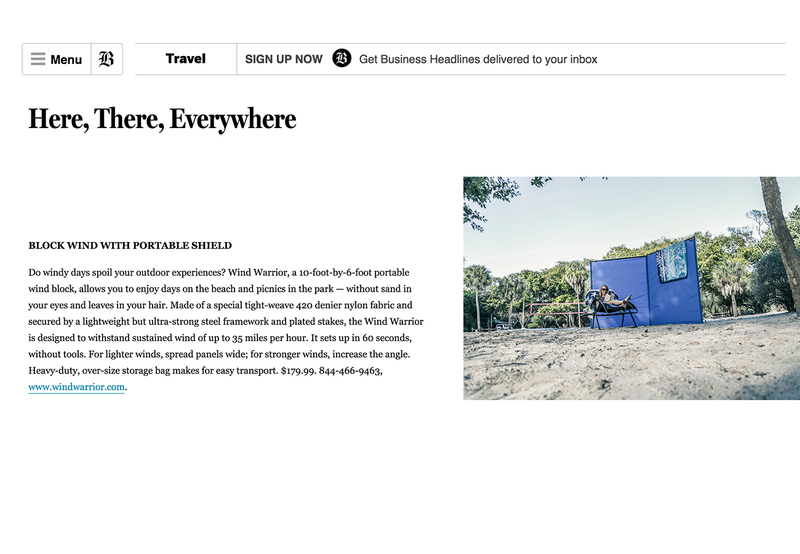 Congratulations to our Client Wind Warrior for their feature in Sunday’s Boston Globe Travel Section (Print and Online). Wind can adversely affect virtually any outdoor activity. A picnic is not so so tasty when the paper plates fly off the table. A campfire is less cozy when the smoke blows in your face. Lighting a grill or lantern is a pain when the match keeps blowing out. Watching a kid’s ball game is far less fun when you’re getting blown away. And simply sitting outside to enjoy the day no longer appeals when the wind blows too hard. Wind Warrior is a 10’ x 6’ portable wind block that sets up in a minute, without tools, and redirects the wind so you can enjoy being outdoors. Made of a special tight-weave 420 denier nylon fabric and secured by a lightweight but ultra-strong steel framework and plated stakes, Wind Warrior will easily withstand consistent winds of 35 mph and gusts even stronger than that. Position Wind Warrior just upwind of your outdoor activity and you won’t believe how easy it is to get out of the wind or how pleasant it is to be out of the wind. Check them out at windwarrior.com!